Here at ChiIL Live Shows, we're very much looking forward to this one. We'll have a full review for you shortly. 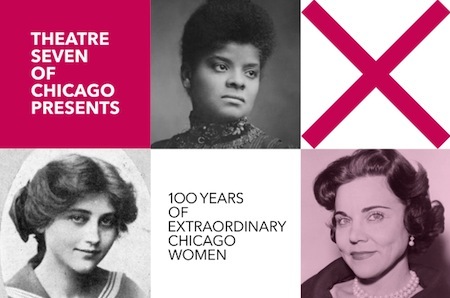 Theatre Seven of Chicago brings together nine talented Chicago’s playwrights to commemorate the 100th anniversary of suffrage in Illinois with the world premiere of UNWILLING AND HOSTILE INSTRUMENTS: 100 Years of Extraordinary Chicago Women. Woven together into one full-length work are the incredible stories of Jane Addams, Myra Bradwell, Ann Landers, Mavis Staples, Cora Strayer, Maurine Watkins and Ida B. Wells, directed by Elly Green. UNWILLING AND HOSTILE INSTRUMENTS plays October 1 – October 27, 2013 at American Theater Company, 1909 W. Byron St. in Chicago. Tickets are available at www.theatreseven.org. UNWILLING AND HOSTILE INSTRUMENTS is written by Seth Bockley (Maurine Watkins), Brian Golden (various), Ike Holter (Jane Addams, 2013), Elaine Romero (Jane Addams, 1889) Emily Schwartz (Cora Strayer), Carla Stillwell (Ida B. Wells), Nick Ward* (Myra Bradwell), Travis Williams* (Mavis Staples) and Lauren Yee (Ann Landers). The production features Echaka Agba, Adithi Chandrashekar, Marsha Harman, Jaclyn Hennell, Tracey Kaplan*, Jessica London-Shields, Jake Szczepaniak, Brittney Love Smith and Joe Zarrow. UNWILLING AND HOSTILE INSTRUMENTS brings together nine Chicago playwrights to pen a play that combines eight stories about extraordinary women from Chicago’s last hundred years to commemorate the 100th anniversary of suffrage in Illinois. In 1913, a vocal opponent of the suffrage movement called women “nothing more than the unwilling and hostile instruments of creation.” This project turns that ignorant quote on its head, celebrating the accomplishments of Chicago’s greatest historical women and also asking relevant contemporary questions about gender and social equality. After select performances, female bands, visual artists and actors will perform, creating an all-out festival honoring the accomplishments of Chicago women. We begin our season with a production that celebrates Illinois’ leadership in the suffrage movement by telling dynamic stories about our city’s most extraordinary women,” comments Artistic Director Brian Golden. “But we're also digging a little deeper. In telling the story of ten Chicago actors trying to put on these new plays, we're using history and theatre to investigate the challenges and realities of race, gender and equality in Chicago today," adds Golden. Written by Seth Bockley (Maurine Watkins), Brian Golden (various), Ike Holter (Jane Addams, modern day), Elaine Romero (Jane Addams, 1889) Emily Schwartz (Cora Strayer), Carla Stillwell (Ida B. Wells), Nick Ward* (Myra Bradwell), Travis Williams* (Mavis Staples) and Lauren Yee (Ann Landers). Featuring: Echaka Agba, Adithi Chandrashekar, Marsha Harman, Jaclyn Hennell, Tracey Kaplan*, Jessica London-Shields, Jake Szczepaniak, Brittney Love Smith and Joe Zarrow. Production team: Kerith Parashak (scenic design), Brenda Winstead* (costume design), Mac Vaughey (lighting design), Joe Court (sound design), Joshua Hurley (props design) and Neal Ryan Shaw (dramaturg). Regular run: Friday, October 4 – Sunday, October 27, 2013. Tickets: Previews: $10; Regular run: $20. Students, seniors and industry $16. Single tickets for the 2013-14 season are available at www.theatreseven.org . Founded in 2007, Theatre Seven of Chicago’s mission is to transform the way Chicagoans engage with their city and to become the premiere center for the creation, development and showcase of theatrically-based Chicago stories. The company has earned nominations for four Jeff Awards and won the 2012 League of Chicago Theatres’ Emerging Theatre Award. The company’s noted world premieres include The Chicago Landmark Project, We Live Here and Diversey Harbor. Theatre Seven company also hosts a robust menu of auxiliary programming, including a free monthly reading series, Shikaakwa, featuring new looks at Chicago plays and one of the best post-show discussions in town.